Each week we present the ‘XUK Citizen of the Week' award. This will be given to the best ‘Citizen’ at camp, who our leaders decide best sums up what’s good about XUK – a sense of humour, friendship, and a desire to make the most of camp. There will be a presentation each week and each winner will be offered one free week at one of our camps next year! •	Departure day: children must be collected between 10:00 and 11:00. Please arrive on time to collect your child. Our address is Abberley Hall School, Worcester, WR6 6DD. We do allow campers to bring mobile phones and electronic devices to our camps at their own risk and responsibility (Juniors – 6 to 9 year olds will hand these in). All campers must adhere to our Mobile Phone & Electronic Devices Use Policy and talk to our team first if they have a problem. If we cannot answer, please leave a detailed message. We will call you as soon as we can. Please be aware that our camp phone is not manned all the time (and will not be manned at all on Wednesdays as we are on a whole camp trip day). Do not be alarmed if you do not get a call from your child. The probability is that you were engaged, out or your child is having too much fun! Delivery of the post is very exciting for those who receive letters. The address is ‘XUK, c/o Abberley Hall School, Worcester, WR6 6DD. Any food sent (or brought to camp) may be checked. This is for the health and safety of all children and staff, some of whom have very specific allergies. You can also send emails to your children to xukactivity@hotmail.com. These are handed out at the next available meal time. Daily updates and a selection of photographs from the day will be uploaded to our XUK Activity Facebook page and Instagram. 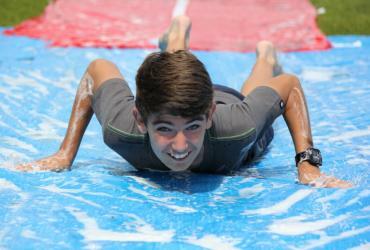 You can view all of the photographs from each day on your CampInTouch account. If your child is bringing medication to camp, you must complete page 5 of the Health & Medication Form. It is essential that we have this information to be able to administer medication. All medication must be brought to camp in a named sealed bag or container. We will store medication in a safe and secure place. We will be going on a whole camp trip every Wednesday to either Oxford, Warwick or Stratford Upon Avon. It is an opportunity to do a bit of shopping and sight seeing whilst soaking up British culture. For our Wednesday trip and Theme park optional extra we give parents of 16 and 17 year olds the option to let them go around town/theme park in small groups without being accompanied by our staff. In order to opt in to this, parents must complete the electronic permission letter which you will be able find on your CampInTouch account.